I recently wrote about new-in-South-Africa Cadbury Dairy Milk Marvellous Creations chocolate, and this week I’m giving a hamper each to two winners. Each chocolate hamper is worth R500, and includes 4 movie tickets and Marvellous Creations chocolate. 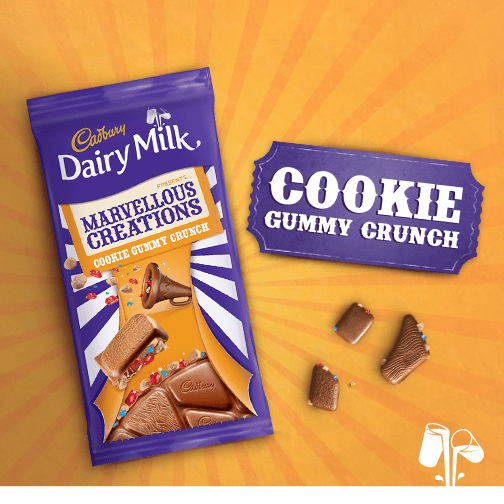 Marvellous Creations is available in two variants – Jelly Popping Candy (160g & 38g) and Cookie Gummy Crunch (160g). The range is also shaped differently, and is a bit chunkier, to allow for a good taste of candy or gummy crunch with every bite. They cost around R7,99 (38gm) and R29,99 (160gm). Simply comment below, and you’ll be entered into the draw. The giveaway closes on Friday 12 June at 9am, after which the winners will be announced on the Rattle and Mum Facebook page, and then emailed. The competition is open to South African residents only. What a yummy prize. Love all those new flavours. I gave my boyfriend a piece of my Cadbury Jelly Popping Candy last night (he never tried it before). The look on his face when the chocolate started popping in his mouth – PRICELESS! We finished the whole slab soon after. I think its his new favourite sweet treat. I gave a piece to my boyfriend last night (he never tried it before). The look on his face when the chocolate started popping in his mouth was – PRICELESS! We ended up finishing the whole slab last-night! I think its his new favourite sweet treat. Haven’t tried it, but looks delicious. Oh my goodness these are delicious!!!! Oooh chocolate. Not good for my diet but who can say NO to chocolate! Would make a lovely add to hubby’s Father’s Day gift! I have tasted both and I cannot decide which one is the best. I think if I had a hamper to polish off I could decide. These are so good, hubby’s favourite is the Cookie Gummy Crunch and mine is the Jelly Popping Candy! Lovely price…..movie date night with hubby with popping candy….!!! Purrrrrr….fect!!!!!!! I am entering on behalf of my son Raine. yummmm!!!!!!!! dying to try these! There can never be too much chocolate goodness in our house – Fingers crossed! This would really be such a “Sweet” win 😉 Fingers crossed. Cannot wait to try cadburys new creations. Sounds out of this world. Thanks for the competition. Movie tickets and candy – best duo for the upcoming winter holidays. Nom Nom! I haven’t tried these yet – they look interesting to say the least 🙂 Thanks for the competition, will definitely drive awareness. Would love to win this hamper! Haven’t tries the new Cadbury chocolate yet! Holding thumbs! Meeeee! I need all the chocolate to survive my 16 month old waking every hour through the night for the past 11 months!! We visited the awesome pop up store & just loved making our own Marvellous creation!!!! I love chocolate, chocolate loves me. This prize & I, we belong together. These are delicious. After having tasted the Jelly Popping Candy for the first time, the following day, my 7 year old son told me he could still feel the popping candy in his throat. They look so delicious, haven’t had a taste yet but am looking forward to trying them. Please I need this prize my chocolate budget is finished because of the Marvellous collection! Oh what a yummy prize! Oh, yes please. Chocolate ftw. Mm jelly popping candy sounds delicious. Whoa ! Popping Candy?! Like the ones I used to eat when I was a kid. Yummy Mummy may I please have one of the hampers? Me! I deserve ALL that chocolate! Delicious ! Perfect for chocoholics ! Confession time i am a CHOCOHOLIC ryt now as i am typing ders a piece melting on my tongue.i can never hav enuf. The popping candy mmmmm delicious . best creation truly after bubbly. We treated our children to a small bar of the popping candy variety of Dairy Milk Marvellous Creations recently, and the look on their faces when they felt the popping was too funny hee hee. They just loved it (and so do we)! Would love to treat them again!! I am leaving on a roadtrip without my kids on Monday (not by choice, if i could take them with me I would!) and either, the chocolate will comfort Mom on the road or it will serve to help dry up girls’ tears! Either way, a glass and a half well deserved! Loved giving my dad a piece of the Jelly Popping Candy… i sat back and watched the tiny explosions bring much joy! What a great prize, and thanks for mentioning the prices – it confirms that our local Spar is overpriced. Thanx for such a great comp! I definitely could use some chocolate cheer-up right now! Truely marvelous creations I can already taste the chocolate…. great give-away. This will be heaven for my kid and I! I would love to win this prize.Can’t wait to taste the new chocolates looks yummy. Great chocolate for the whole family. ..
I’d love to win this prize for my kids! I absolutely love these chocolates!! I can’t seem to get enough.. neither can my two daughters.. my hubby buys for us and then he ends up eating most of it.. guess we all have a marvellous creation addiction that needs to be fed constantly!! CadBury marvellouse creations !!!!! Wow times 10million !!!! !candy infused chocolate.its like rocky road just 10million times better…seriously.WOW !WOW !WOW ! Yes please – perfect for dad! The new Cadbury Marvelous Creations ate divine! Forget the birds and the bees talk let’s talk chocolate…..
Nom Nom, Yum yum in my tum tum. Sounds dreamy and divine….like little fairies walking on my tongue…. Yes pleeeeeease. This is real Willy Wonka stuff. It’s 5am and I’m drooling. How delish do those choccies sound?